If you cannot find your provider, or need help locating a provider near you, please contact us. Members may also refer a vision provider for recruitment into our network. Click here to refer a provider. 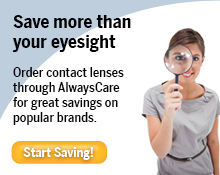 AlwaysCare offers access to several quality national eye care networks. We encourage you to contact us or your selected provider prior to visiting their location. Wal-Mart locations will not extend discounts on frames above the plan allowance, lens options, contact lenses or contact lens fittings. Some providers may not offer discounts on prestige frames or amounts over the allowed benefit. For information on how to use your benefits at Costco Optical locations please login as a current member.